Visits: 21054 persons viewed this recipe. 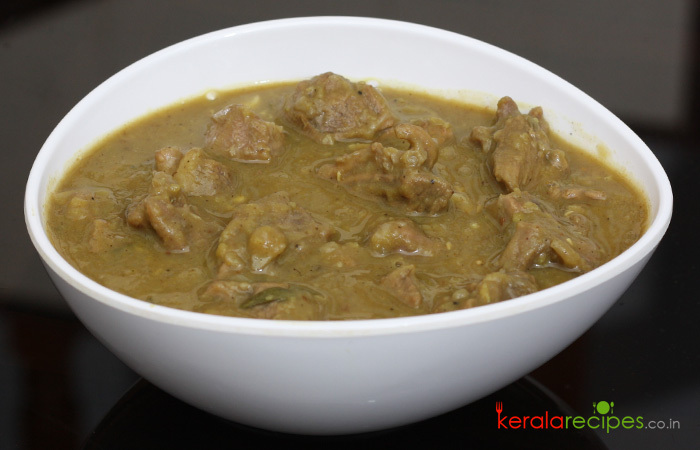 Dalcha is a popular Indian side dish made from mutton and dal. It is usually served as a side dish for rice, biryani, pulao, chappathi etc. Dalcha is flavored with ginger, garlic and spices. Here you go with the recipe. Cut mutton into small pieces, wash and drain it. Chop onions, garlic (15 Cloves) and coriander leaves. Slit green chilli length wise. Wash split bengal gram, split green gram, split red lentil. Soak in water for 30 minutes and drain it. Pressure cook it by adding turmeric powder (½ tea spoon), salt and water (4 cups). Heat 4 table spoons of cooking oil in a vessel and put cinnamon, cloves and cardamom. Stir it for few seconds and proceed to add ginger-garlic paste, green chilli and onion one after another. Saute it in a medium flame. When it turns golden brown, put coriander powder (2 table spoon) and turmeric powder (1 tea spoon). Stir it for 1 minute. Add mutton, curry leaves and salt as needed. Increase the heat and stir it for 3 minutes. Add 4 cups of water, combine well and cook it covered till done. (When it starts boiling reduce the heat to medium). Add the cooked and mashed dal (lentils) into the prepared mutton. Combine well and cook it for 5 minutes. Heat 4 table spoons of ghee in a cooking pan. Reduce the heat to low and put cumin seeds. When it splutter, add chopped garlic and stir it for 1 minute. Put 1 table spoon of coriander powder and 1 tea spoon of cumin powder. Stir well for few seconds. Add this to the prepared Dalcha along with the tamarind pulp and cook it for another 5 minutes. 1) You can also prepare ‘dalcha’ with any one the of dal (preferably split bengal gram / chana dal). Thanks for the recipe. I will try it. Can please let me know the recipe of Vattayappam (soft). Mary Francis, Thanks for trying this recipe. I have already posted Vattayappam Recipe, please check it in the snacks category.